Today is my favorite attraction in all of Walt Disney World’s birthday, Big Thunder Mountain Railroad. Though it wouldn’t officially open until November 15 of 1980, its first soft openings began on September 23, 1980. In honor of I.B. Hearty, I.M. Brave, I.M. Fearless, U.B. Bold, U.R. Courageous, and U.R. Daring we are showcasing two interesting pieces of Big thunder Mountain Railroad history. 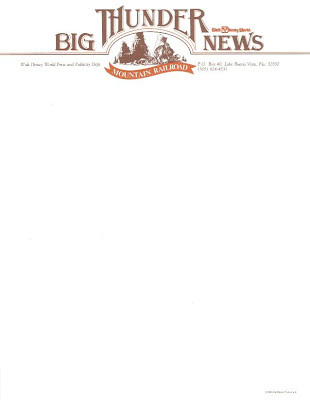 The first is a copy letterhead entitled Big Thunder News. This sister publication, as you might say, was used by the Walt Disney World Press and Publicity Department as a way to promote the upcoming arrival of the overdue mine trains. The second is an article that ran in the Winter 1980/81 issue of the Disney News giving a brief history of the attraction. The skeptics may have raised an eyebrow when or two when the idea for a Walt Disney World Big Thunder Mountain Railroad first surfaced some eight years ago. A mountain in Florida, themed to the Western Gold Rush times would be completely out of its geographical and historical element. Transforming this towering vision into a Magic Kingdom reality was going to require passage through time and space barriers of more than a century and thousands of miles. But anything is possible when it comes to the diligent Disney imagination. With little more than a sand dune for reference, artists, designers and engineers soon produced renderings, scale models and show plans from which to begin this tremendous project. This mountain was not to be a duplication of Big Thunder in Disneyland. With more space, less greenery and a flattened terrain, environmental considerations were all together different. Rather than the castle-peaked Bryce Canyon look of its predecessor, this attraction would resemble Colorado’s Monument Valley or the Grand Canyon. Almost two years were required to construct this monumental showpiece. From the “Top of the World” in the Contemporary Hotel, observers could oversee the progress. Iron rebar was shaped into formation and wire mesh covering filled in the contours. Than [sic] came the concrete and rockwork details. Finally, from five acres of Florida’s sot shell and sand flatland rose a magnificent formation of sentinel-type peaks as high as 100 feet. And, so convincing were the rusty hues of weathered and eroded rock, most any distant bystander could be fooled into perceiving a natural element. Impressive as it was from afar, there was still much to be done. A phosphorescent pool was given rainbows of color. Screeching bats were added to a dark and foreboding cave; water to the waterfall…and earthshaking motion to an avalanche. For decorative tools of the mining trade, Disney prospectors scouted auctions, swap meets and old mining towns. The Disney determination paid off. In rolled an antique ore wagon and skip cart, and soon other artifacts added authenticity to the deserted mine setting. The great American West was inconceivably born again in an unlikely Florida location – where a “runaway” train transports its brave passengers through a colorful, historical time. Come experience Big Thunder Mountain Railroad – the newest exciting adventure in the Walt Disney World Magic Kingdom. Your blog continues to give me mountains of insight to WDW. What a great post. Thank you.